Visiting Indian towns and cities is fine, but have you ever thought of visiting Indian villages where you can get a chance to explore a completely different culture and tradition? If no, then think about it before you actually miss an ultimate experience you have never thought of before. Take a tour to villages in and around Varanasi, which will give you a chance to closely watch the lifestyle of the villagers and see how even today they have preserved their old culture and tradition for coming generations. After breakfast transfer to the airport to board the flight for Varanasi. On arrival at Varanasi airport meet our representative and transfer to the hotel. In the evening, we shall take you to the river ghat for evening aarti. Enjoy aarti darshan at the river ghat and get amazed with the rituals of lams and holy chants. Later, return to the hotel for an overnight stay. Later, return to hotel for breakfast. After breakfast we will leave for an excursion to Sarnath and Lamhi village. 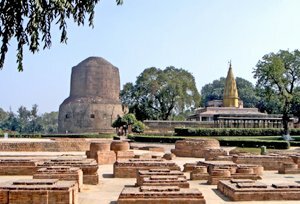 Sarnath is situated 10 km east of Varanasi, is one of the Buddhism's major centers of India. After attaining enlightenment, the Buddha came to Sarnath where he gave his first sermon. Visit the deer park and the museum. Later, drive to Lamhi Village situated towards west to Sarnath. The Lamhi village is the birthplace of the renowned Hindi and Urdu writer Munshi Premchand. Munshi Premchand acclaimed as the greatest narrator of the sorrows, joy and aspirations of the Indian Peasantry. Born in 1880, his fame as a writer went beyond the seven seas. He died in 1936. Visit several cattle Farm, School and Agricultural fields here and later return to Varanasi for an overnight stay. After breakfast in the hotel, we will go for a visit to the Rameshwar village. The village is situated on the bank of River Varuna on the sacred Path of Varanasi. During our visit to Rameshwar village we will visit their Cattle and Agricultural Farm. We will also visit the Sanskrit school and Ashrams situated in the village. Later return to Varanasi. Evening is free for leisure. An overnight stay at hotel. In the morning after breakfast we will have a guided city sightseeing tour of Delhi. We will visit Raj Ghat and Shanti Vana - the cremation sites of Mahatma Gandhi and Jawaharlal Nehru, Jama Masjid and drive past Red Fort and Chandni Chowk. In the afternoon, visit Qutub Minar built by Qutub-ud-Din Aibek in 1199, Humayun's Tomb, India Gate (War Memorial Arch), Lakshminarayan Temple - a modern Hindu Temple. Also, drive to the past President's House, Parliament House, and Government Secretariat Buildings & Connaught Place shopping centre. Later in the evening, transfer to the international airport to board the flight for onward destination. In the morning after breakfast we will have a guided city sightseeing tour of Delhi. We will visit Raj Ghat and Shanti Vana - the cremation sites of Mahatma Gandhi and Jawaharlal Nehru, Jama Masjid and drive past Red Fort and Chandni Chowk. In the afternoon, visit Qutub Minar built by Qutub-ud-Din Aibek in 1199, Humayun's Tomb, India Gate (War Memorial Arch), Lakshminarayan Temple - a modern Hindu Temple. Also, drive to the past President's House, Parliament House, and Government Secretariat Buildings & Connaught Place shopping centre. Later in the evening, transfer to the international airport to board the flight for onward destination.